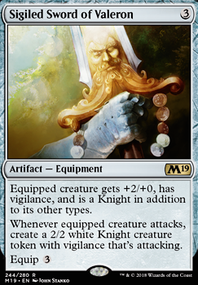 Other Knights you control get +1/+1. : Knights you control gain double strike until end of turn. Murphy77 sorry for the late reply. A friend of mine asked me to try out Elenda, the Dusk Rose as well which I am still yet to do, I do find Vona, Butcher of Magan is actually not usually a dead card, for example if i'm playing against the mono red deck, I can gain so much life off of Vona easily especially If I have Valiant Knight in play too, it can make my opponent focus their burn on Vona instead of me as well. Bladebrand I don't think i'll try to fit it into this deck as there isn't a real need to I can see it working well with the first/double strike aspect of things. 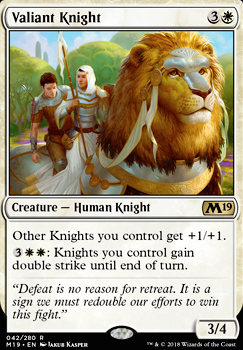 But my knights can get quite strong, plus with the first/double strike they can usually take down big threats, Vona and Aryel, Knight of Windgrace already have some great removal potential as well if I really need to take something down in order to win. I haven't really considered Abnormal Endurance or Demonic Vigor at all really, I personally think that they just aren't too useful. Lord_Europa With the deck being a more focused on you can fit Benalish Marshal in quite well, you can use it in place of something else, which would be most likely instead of Aryel, Knight of Windgrace , Vona, Butcher of Magan or even Valiant Knight . 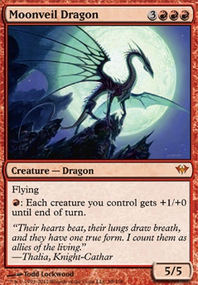 Though I personally like the idea of the extra removal to help deal with certain decks, like for example a deck full of flying creatures. I'd still take Valiant over Benelish because It can give a way to dump mana or provide a lot of damage with double strike and it is just slightly harder to kill. If you are going to go tribal I would suggest that you pick one tribe, it will make your deck more consistent. Overall I would suggest going Knights, but if you want to go angels you could do that too. Vanquisher's Banner , Radiant Destiny , and Valiant Knight are some good tribal cards. Josu Vess, Lich Knight is a funny card that can close the game if you can kick him. The Immortal Sun shuts down Planeswalkers, the buff and card draw is also very nice. If you need more mana Smothering Tithe is good, especially against the spam-draw decks. You don't have to take all these suggestions, but I hope they give you something to think about. I know that I want extremely heavy on the knight theme, but that was because I like them and have built a deck. If you want anymore ideas I would highly suggest taking a look at it. I hope that I could be helpful! Phyrexian Metamorph is the most functional clone effect to double on exemplars. Mirran Crusader is by far the most powerful knight to grace mono white. Valiant Knight is rather powerful for a knight lord Benalish Marshal is rather good as an anthem on a creature. Though your knights might want to ally with Thalia, Guardian of Thraben to better survive w/u control, Field of Ruin is also rather nice to survive tron decks. 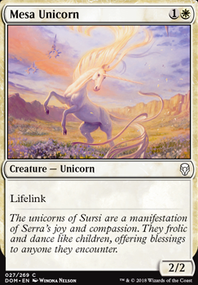 Rest in Peace and Stony Silence are white's biggest contributions next to path for modern, not having them in a sideboard is not too good an idea. Personally I think that History of Benalia is a must for any aggro deck, but I can definitely understand if you want to keep it budget. As other cards you might or might not want to include in your sideboard, I suggest Adamant Will for combat tricks and Luminous Bonds or Seal Away. Ixalan's Binding could also work but of course you can't bring an answer to everything with aggro (and 4 mana can be taxing). Hope this helps! If you are interested, I also tried to craft a monoWhite Knight aggro deck before GRN. The difference was mainly in the fact I focused on Knights to use History of Benalia third effect and to exploit the active ability of Valiant Knight. well card draw might be a tad difficult to find for white, fire and ice is about as close as you can get, but History of Benalia is also pretty close being two knights and a pump spell packed into one card. Valiant Knight might also be a tad stronger of a choice to run than kinsbaile as it survives more removal on its own and interacts much stronger with Mirran Crusader curves, really the only 3 drop kinsbaile really buffs noticeably would be an autumn pumped route, all the others it's a trade of 1-3 dmg for a bigger body. You’re not playing History of Benalia and Valiant Knight because you want to keep this budget, right?